The scene: a fogbound lighthouse on a dark, rocky island somewhere off the English mainland, sometime around 1905. A small group of bickering shipwreck survivors, superstitious workmen, and two time travelers are hunted by a lethal yet secretive hostile alien. Only by banding together would they all have a chance to survive, but the divisiveness of fear, pride, and, most of all, greed dooms them as surely as the mysterious thing lurking in the shadows. And while the Doctor dutifully steps in to save them from the alien, he doesn’t lift a finger to save them from themselves. “Horror Of Fang Rock” is a perfect distillation of the Doctor-Who-as-gothic-horror-movie approach that was the hallmark of the early Fourth Doctor years, under the producer/script-editor team of Philip Hinchcliffe and Robert Holmes. So perfect, in fact, that the oddest thing about it is that Hinchcliffe was gone from the series before it was made, having been pushed out the year before, after “Talons Of Weng-Chiang,” essentially because his horror-tinged Doctor Who was becoming too controversial. The show’s new producer was Graham Williams, who eventually ushered in the lighter, more comic style epitomized by “City Of Death” and the season-long Key To Time arc. But the first few stories of Williams’ first season were more or less indistinguishable from Hinchcliffe’s era, with an emphasis on scares and creepy atmosphere, I suppose mainly because Robert Holmes stayed on as script editor for those serials before handing his job over to the next guy. “Horror Of Fang Rock,” written by Terrance Dicks, is the best of those three. Which is not to say this is a flawless story. The pacing of the ending is off, for one thing, getting the main villain out of the way a little too early and leaving a lot of time to spend on the Doctor racing to destroy a pretty undramatic ball of light. And the special effects are often unconvincing, particularly the toy yacht that crashes at the end of episode one. But mostly, the story makes a virtue of its budgetary and space limitations, creating a sense of moody, claustrophobic menace by confining the action to a handful of small, dimly lit sets comprising nothing more than a few rooms in the lighthouse and the jagged rocks just outside. Especially in the early going, the story sets a tone of rising tension with admirable efficiency. Three lighthouse-keepers are stationed on an isolated outpost. The youngest, trainee Vince, witnesses a fireball crashing into the sea, and soon afterwards the station’s electric generator fails. This sets off an argument between the two senior keepers, middle-aged Ben and crusty old seadog Reuben, over the merits of old-fashioned oil-burning lighthouses vs. the newfangled electric kind. Reuben is stuck in his ways and hates electricity, which of course makes his eventual fate the most darkly ironic of any of the deaths here—electricity not only kills him, but in a very real sense it replaces him. There’s also a pattern established: Because we see a shot of the lighthouse from the viewpoint of the alien, we know more than the characters in the story do about what the danger is. And that continues through the rest of the story—the alien’s ability to shapeshift is revealed to the audience far earlier than it is to the Doctor, for instance—which allows for plenty of moments later on that get a dramatic charge, sometimes very subtly, from that tension. 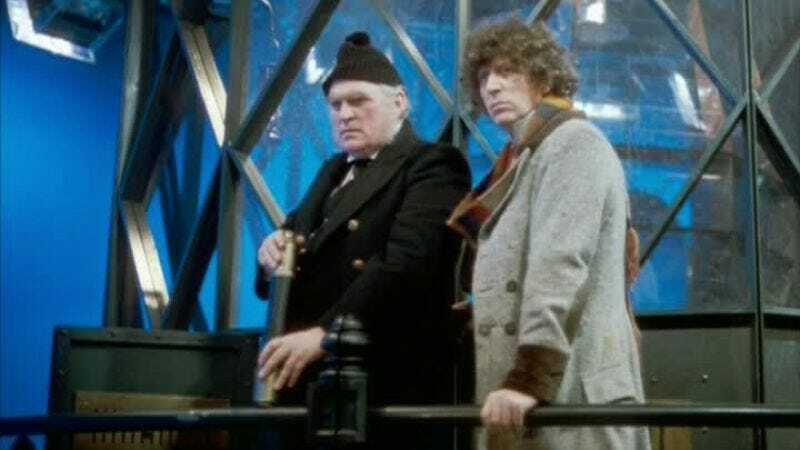 Also important: Although this time around, the TARDIS crew is easily able to explain their presence with the white lie that they’re mariners, there’s a point early in the story where Reuben openly suspects them of being foreign spies. The superstitious old-timer also suggests the possibility of vengeful ghosts or the return of a legendary sea monster that left another Fang Rock crew all dead or insane. These are all misdirections, since we already know that none of what Reuben says can be true—but they’re crucial in establishing the story’s shroud of unease and menace. The shipwreck at the cliffhanger of the first episode brings in the second half of the cast—the selfishly greedy nouveau riche Lord Palmerdale, his prim secretary Adelaide, the gruff sailor Harker who saved all their lives when Palmerdale’s foolish haste ran their ship aground, and Col. Skinsale, whose deep-set sense of honor has been compromised by his weakness for gambling and allowed Palmerdale the chance to become even richer at Skinsale’s expense. What’s important about all four of them are their weaknesses, which drive the plot forward and mire them in deeper and deeper danger. Arrogant, entitled Palmerdale is so focused on securing his ill-gotten wealth that he pays no attention to the real danger lurking outside, and distracts the others as well. Adelaide knows little beyond how to be a “proper” Victorian lady and frivolities like astrology, and is useless in a crisis. And Skinsale’s vanity over his gentlemanly honor leads him to destroy the station’s telegraph, cutting them off from the outside world, just to spite Palmerdale. The alien itself really is a sea monster, if not the Beast of Fang Rock that Reuben warned of. The glowing green jellyfish is a Rutan—a species mentioned twice before in the series but not seen until this serial, they’re the sworn enemy of the Sontarans, and in many ways a distorted mirror-image of them. 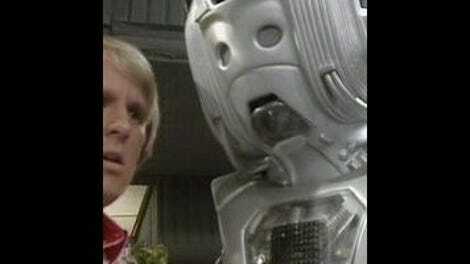 Amorphous and gossamer, they’re physically the opposite of the stocky and compact Sontarans. And where the Sontarans are clones, meaning that a platoon of individual Sontarans are all alike, the fact that the Rutan refers to itself as “we” implies that it’s some kind of gestalt being, so that one Rutan is made up of many individuals. Still, they’re also just as belligerent and militaristic, and the threat they pose to humans is essentially the same. Like the Sontarans of “The Time Warrior” and “The Sontaran Experiment,” the Rutan is only interested in Earth as a means to gaining the upper hand in its war elsewhere in the galaxy, and casually willing to destroy our planet even though we have no stake in the war one way or the other. All the worries and foibles of the humans in the lighthouse are irrelevant to the Rutan. This also makes an interesting contrast with season 15‘s TARDIS crew—Tom Baker as the Fourth Doctor and Louise Jameson as Leela, a refugee from a savage jungle planet who is simultaneously naive about “civilized” behavior and frighteningly competent and wise in the ways of survival. Together, they make one of Doctor Who’s most unusual main casts—both are compelling and well-drawn characters, but with such unusual backgrounds and perspectives that neither are easy identification figures. Even notwithstanding that the Doctor really is an alien, the three previous Doctors before Baker had been variations on a type of arrogant and eccentric scientist who didn’t always relate easily to ordinary people. But the Fourth Doctor’s aloofness had an edge to it that hadn’t been seen before, and for all that he cared about humanity in the aggregate and about certain individual people he happened to befriend, he had no patience for what he considered our weaknesses—friendlier than the evil jellyfish, though, at least. Here, he’s also rather cagey about what’s actually going on, putting on a false show of calm to keep the others from panicking or even suspecting there’s anything wrong—at least until he feels that things have gotten bad enough that it’s necessary to simply declare that an alien has them under attack, which gets the skeptical reaction it deserves. He’s motivated by caution, but keeping the others in the dark only puts them in greater danger—especially after he makes the crucial mistake, after the second cliffhanger, of looking for Reuben outside rather than in the lighthouse’s coal roam, where he lies dead, and thus locks their enemy inside the building with them. Leela’s perspective is bracingly unsentimental, particularly in comparison to the genteel and straightlaced Victorians she meets here. Surely nobody else has ever shut up Palmerdale with a line like “Silence! You will do as the Doctor instructs, or I will cut out your heart.” Leela is probably my favorite Doctor Who companion, and “Horror Of Fang Rock” has a wealth of great moments to showcase her often jaw-droppingly casual badassery. Hearing that Palmerdale’s yacht has foundered on the rocks, she notes with simple matter-of-factness that “they will all die then,” and prepares to turn away and move on to the next thing. Where she comes from, people die every day. It’s not a big deal. You don't dwell on it. Leela is human, but in her way she’s also just as alien to the Doctor as she is to us. They respect each other, of course. Leela admires the Doctor’s wisdom and learning, and the Doctor has complete confience in her instincts and her competence. But there’s a wide gulf between them that no other Doctor/companion relationship has, including a clear sense that the Doctor often finds Leela’s morals and uncomplicated approach to death abhorrent. But her scenes with Adelaide also show another side to Leela. Stone-Age savage though she is, Leela’s also far more forward-thinking and capable than the stereotypically useless Victorian secretary. And her dismissal of Adelaide’s belief in astrology is a quiet little gem: “A waste of time. I too used to believe in magic, but the Doctor has taught me about science. It is better to believe in science.” Jameson delivers the line with such simplicity and honesty that it loses whatever preachiness it might have had, and is simply a small, powerful statement of truth. The Doctor’s taciturnity also masks his own awareness of his vulnerability—notice how he refuses, with quiet disgust, to dignify Leela’s praise that surely a Time Lord like him “will easily dispose of this primitive creature.” He’s as vain and arrogant as any other version of the Doctor, but he knows his limitations, and that a single alien soldier, marooned and desperate though it is, could very possibly kill him. That’s quite a change from the cocky grandstanding the Doctor indulges in elsewhere in the series, especially in today’s version but also when Baker was around too. But I think it’s good to see this side of him—he is, after all, just one guy out there alone in a big and hostile universe, and it makes the series more interesting to remember that. • A minor point, but worth considering: Why does the TARDIS land by the Fang Rock lighthouse in the first place? The Doctor intended to land on the beach at Brighton instead, and claims that his ship “got lost in the fog.” Ah, but: The fog isn’t natural. The Rutan is creating it, presumably using the advanced technology of a spacefaring civilization, to hide itself and to make the climate colder for its own comfort. And note that the TARDIS lands just moments after Vince notices the fog coming in. The Doctor might think that he arrived by accident just in time to encounter the Rutan, but the timing seems suspicious to me. Since the Doctor didn’t do it, it seems likely to me that some outside force—either the Time Lords or the TARDIS itself—became alerted to alien high-tech being used on 1905 Earth when it should have been there, and sent the Doctor to investigate. Which isn’t a stretch, considering that Bob Holmes thought that sort of thing had been happening to the Doctor all the time anyway. • Leela’s eyes change color when she unwisely looks up at the exploding lighthouse because Louise Jameson’s eyes hurt from wearing contact lenses to make her eyes brown. • As they leave, the Doctor quotes “The Ballad of Flannan Isle,” by Wilfred Gibson. The poem, written in 1912, is about the mysterious disappearance of three Scottish lighthouse-keepers. It’s an apropos quotation, but also a little cold-hearted considering that he’s leaving half a dozen bodies behind him with no attempt to explain what happened for the benefit of their families. • Feb. 8: The first part of season 23’s “Trial Of A Time Lord,” the Robert Holmes-written “The Mysterious Planet.” The other parts of this season, all of which link into a single long narrative, will follow in subsequent weeks, alternated with stories from other years. • April 19: Something from the Seventh Doctor? It’s been a while since we’ve visited him. • TBA, when it’s out on DVD: Patrick Troughton's "The Moonbase."